THE EXCAVATION of a man buried with a horse and lavish grave goods at RAF Lakenheath attracted national media attention. Evidence of a burial mound led excavators to suspect that the burial might be important. When the soil was stripped away the amazing find was revealed. The grave contained the body of a man in his mid 30s. He was 5’ 10‘’ tall with a muscular build. There was no obvious cause of death and his bones suggest he would have been in pretty good health. This man was buried in a wooden coffin with his sword and his shield and spear would have been laid on top. Close by were cuts of lamb – perhaps for a meal in the afterlife. 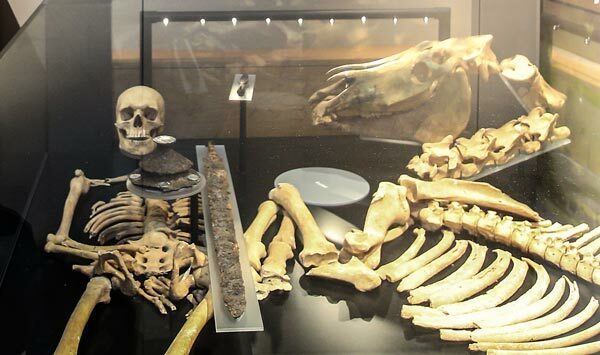 A horse wearing decorative bridle fittings was also buried with him and a wooden bucket close to the horse’s head suggests that perhaps he too was left a final meal. We do not know the funeral rites of his people, but horses were valuable to Saxon people and this one was sacrificed, probably at the grave site, to join the warrior in the afterlife. The objects chosen to accompany this man identify him as a warrior – whether this was the case we do not know but it is how those who buried him wanted him to be perceived.